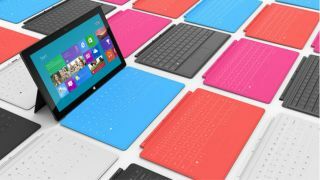 Microsoft's Surface RT tablet will soon be on more store shelves, namely those that aren't run by the Redmond-based corp. The company announced its plans to push the RT tab to additional retailers by the middle of the month in a press release Tuesday. Buried in the retail talk was another tidbit: Microsoft is bumping up Surface production. "We've increased production and are expanding the ways in which customers can interact with, experience and purchase Surface," Panos Panay, general manager, Microsoft Surface, said in the release. Today's announcement confirmed rumors that surfaced Friday that the Softies were planning a two-phase push to pump out their Windows 8 slate at retailers outside company-branded storefronts. Non-Microsoft retailers in the U.S. and Australia will see the Surface first, while additional countries will join the Surface fest in coming months, the company's announcement read. Office supply chain Staples confirmed that it will carry the tab as early as Wednesday in all locations as well as online. Best Buy chimed in that it will start selling the Surface online Wednesday starting at 12 p.m. CST and at select retail stores and Mobile specialty stores in the U.S. on Saturday. In Australia, retailers JB Hi-Fi and Harvey Norman both confirmed they will be stocking the tablet as well. Microsoft assured that Surface sales are still available at company stores in the U.S. and Canada and online in Australia, Canada, the U.S., U.K. and other countries. Not only is Microsoft expanding Surface retailers, but at least some of the holiday stores constructed just for the season will remain active into the new year, with a number to be converted into permanent retail outlets. The company had set up 32 holiday stores in North America prior to the Surface's launch. Based on the success of those locales, all will extend into the new year. It's unclear at the moment which ones will transition into brick-and-mortar locations and which will switch to "specialty store locations." While the retail push should help boost sales of the Surface RT, Microsoft is probably preparing for the mad dash that should follow the release of the more powerful Surface Pro. That tablet, complete with the full Windows 8 suite, is due in January.